Island communities are vulnerable to rapid changes in economy, climate, fuel prices, material supply, and tourism trends. 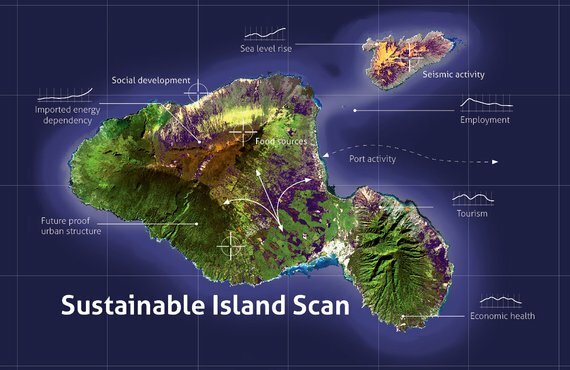 The Island Renaissance (IR) system detects and maps crucial dependencies, identifying opportunities to strengthen the local economy and to realize flourishing island societies. The integrated approach of IR is based on a proven system that enables resilient, sustainable and beautiful island communities that are prepared for the future. Our modern world faces big challenges. Economic systems are failing, growing populations and ecological decline lead to rising food prices and growing energy demands. Our dependencies on other parts of the world are increasing yearly. Climate change is just one of many issues forcing us to change the way we live. Solving these issues for the world as a whole takes a lot of time. Islands commonly feature more dependent economies, due to their size and reduced diversity of resources, and will be affected rapidly. As food and fuel prices rise, the cost of living will increase fast. Economic depression will affect island economies (e.g. by a decrease in tourism). Building towards a resilient and autonomous island community is critical to its future. But where to start, and how to make sure the necessary investments benefit the economy now as well as in the future? Island Renaissance answers these questions. Using IR, building strong economies and lowering dependencies go hand in hand. New technologies that focus on localized economic cycles, ecosystem services and smart urban innovations become very attractive and beneficial for islands. They increase living quality on the island and create new opportunities for tourism. In our decade of work, we’ve found that it’s highly effective to find solutions that affect several areas at once, for instance, using energy generating technologies that support the local community, builds biodiversity and functions as a tourist attraction. In order to find these multi-faceted solutions for island communities, we developed Island Renaissance. Since 1999 we have worked to perfect this approach, built a team of worldwide experts and gathered experience in a wide range of fields. Contact us to find out more. An overview of feasible solutions to climate change, global economic distress and ecological issues. Vision on strategic Island development formed by a team of global experts on all relevant topics.